AMD has unveiled the launch lineup for their second generation A-Series APUs for desktops based on Trinity silicon. The chip designer launched mobile processors of the same variety earlier this year to take advantage of seasonal back-to-school sales while desktop components remained in development. Desktop A-Series APUs will only work in Socket FM2 motherboads with A75 and A85 chipsets. APUs will consist of four (or two, depending on the model) x86-64 cores split across two Piledriver modules and will contain Radeon HD 7000 series graphics. Furthermore, AMD has integrated the northbridge and dual-channel DDR3-1866MHz memory controller onto the APU for what appears to be the complete package. The high-end A10-5800K and -5700 both contain Radeon HD 7660D graphics with 384 VLIW4 stream processors, four CPU cores, 4MB of cache and Turbo Core 3.0 support. The 100W TDP –K part is unlocked for easier overclocking with a base clock of 3.8GHz. The slightly slower A10-5700 ships out at 3.4GHz with a 65W TDP. Mid-range A8 components include the 5600K and the 5500. Both utilize an HD 7560D GPU with 256 stream processors, 760MHz GPU clock speed, four CPU cores and 4MB of cache. Again, the –K series chip is unlocked with a higher 100W TDP while the 5500 requires only 65W. AMD’s budget processors are the A6-5400K and the A4-4300. 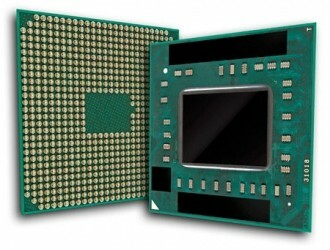 Both are only dual-core components with 1MB of cache, Turbo Core 3.0 support and a 65W TDP. Expect less graphics processing power as well as the –K series has 192 stream processors while the 5300 only ships with 128. These new desktop components are expected to hit retail sometime next week. Pricing should start around $70 on the low end and top out around $140.